Is there a 4k video converter that can do 4k video processing all at once, such as transcode, compress, edit and upload large 4k ultra HD videos without any problem? Check the answer here. The age of 4K is here. Resolution of such video can be either 3840x2160 or 4096x2160 pixels that allows for much more details than 1080p/720p and makes everything clearer and crisper. This makes 4K videos arising out everywhere, be it on YouTube, Netflix, 4K TVs, monitors and projectors, gaming systems, Blu-ray discs, or shot by iPhone, DJI drone, 4K camcorders, GoPro action cameras, and yelling out the great leap from HD to 4K. Part 1: What Is 4K Video Processing? Part 2: What Are the 4K UHD Advantages over HD and Blu-ray? Part 4: Is there A Tool to Process 4K Videos Fast Without Loss? Part 5: How to Process 4K Videos Within 3 Steps? Part 6: Where and How to Get 4K Ultra HD Contents? Part 1: What Is 4K UHD Video Processing? Apparently, 4K UHD gives you a better viewing experience for impressive sharpness and clarity. That's why an increasing number of people turn to 4K ultra HD video indeed. However, over the interim from HD to 4K, a new concept comes into being as the accompaniment of 4K UHD videos - that's 4K video processing! 4K video processing is the the process of dealing with videos, including encoding/decoding, compressing, editing, adjusting parameters like resolution, bitrate, frame rate, aspect ratio, audio etc. to enhance the 4K video playback effect. It emerged for various reasons, but mainly because the real 4K video (4096 x 2160) is unmatched with the 4K TV or monitors screen display in 3840 x 2160. Besides, the facts that the ordinary hardware is insufficient to support 4K video playback, and 4K video takes too much storage space and consume a great deal of bandwidth are also the significant causes for the advent of 4K ultra HD video processing. Part 2: What Are the 4K Ultra HD Advantages over HD and Blu-ray? Let's start with the basics. 4K resolution refers to a resolution of 3840 x 2160 pixels, more than 8 million pixels in total, which is four times the 1920 x 1080 pixels found on your full HD TV (namely HD resolution). Blu ray is a digital optical disc data storage format, which is capable of storing several hours of video in 1080p/720p high-definition and ultra 4K resolution. Undoubtedly, 4K resolution win big over HD in image quality as it could hold more pixels, leading remarkable sharpness and clarity. As for 4K and 1080p Blu ray, shading, especially in the dark, is more nuanced on the Blu-ray. 4K streaming and 1080p Blu ray almost neck-and-neck, if watching them on a latest 4K TV which does a good job of upscaling. But there is a better option - 4K Blu ray, outputting crisp picture with stunning clarity, vivid colors and subtle shadows. One of the best things about 4K BDs is high dynamic range (HDR) which ramps up contrast, brightness and colour range. Part 3: How About 4K Disadvantages? How to Get Over Such Weakness? Though 4K enjoys a great popularity for its crisp picture, stunning clarity, vivid colors etc., there are pains with 4K ultra HD. It claims high requirements on the computer hardware. Videos in 4K or 8K may pose problems such as crash during playback due to the video resolution issue or if on a computer with old graphics card. This is not the end, there are still many other problems and questions with 4K Ultra HD video files, when you go a step further with 4k UHD videos. Now check the details and find a way to get over the 4K UHD disadvantages. No everyone has the luxury of buying a blu ray player to watch the UHD BD, more people prefer to watch 4K videos on Mac and Windows desktop. This means you need go over a certain time of hardware replacement as 1080p HD first appeared, otherwise you'll encounter a number of problems like 4K get choppy or stuttering, laptops get overheated, 4K video images freeze and even 4K UHD fails to play. Briefly, hardware matters a lot on 4K video playback. The first comes the 4K video decoding error oriented from poor hardware configuration. Take iPhone recorded 4K video as an example, you need decode HEVC/H.265 at 10-bit color and HDR for 4K and even 8K UHD videos. Both software decoding and hardware decoding are available, but requiring high hardware configuration as well. For solely CPU decoding, at least an Intel i7 or AMD Ryzen 5 or better CPU are needed to get a good experience. But frankly, CPU decoding could consume a lot of resource, and it's easy to get a high CPU usage, up to 350% for i7 processor. So when you have a high frame rate 4K video, like 4K at 60 fps, you'd better turn to hardware decoding. GPU is the top priority for hardware decoding. For Nvidia PurVideo hardware decode technology, only PureVideo VP7 or later is available to decode 4K HEVC 10-bit color videos. Specific to the graphic card, the latest Pascal family including GP102, GP104, GP106, GP107, GP108 chips is all built with PureVideo VP8 tech. But for Maxwell family, only GM206 chip enables 4K HEVC decoding with PureVideo VP7 supported. Check the full list Nvidia video encode/decode GPU support. AMD GPU hardware decoding benefit from the UVD technology. Merely UVD 6.3 version or above is able to decode HEVC codec 4K in 10-bit color. Thus you can choose AMD RX400 and RX500 series discrete graphics. It's worth noting that AMD APU is incapable for hardware decoding indeed. Intel Quick Video Sync is the key for Intel hardware acceleration. Only the Broxton (the latest Atom system on chip that has been canceled) and 7th Kaby Lake Intel Core processor support decoding 4K HEVC with hardware acceleration. An inappropriate choice of 4K video players may lead 4K video won't play issues as well. Many people who are new to 4K ultra HD videos may take it for granted that a 4K video player is enough to play 4K videos smoothly if the hardware configuration is good enough. Absolutely not, to play 4K ultra videos on Mac or Windows without choppy and stuttering, it's best to utilize a solid 4K video player, along with LAV fliter and madVR renderer. PotPlayer or MPC-HC with LAV and madVR are the recommended solutions. HDMI has also been cited as cause of 4K video playback failed. Your 4K video is decoded successfully on computer. Does that mean you can watch your 4K UHD videos on 4K monitors? Not exactly. Only HDMI port and DP port are available to output 4K videos. DP 1.4 is sufficient for 4K HDR at 60fps. But HDMI requires the version above HDMI 1.4, and for 4K videos at 60fps, you need HDMI 2.0 or the upgrades HDMI 2.0a. The reason why Macbook Pro cannot play 4K videos at 60 fps through HDMI is that it doesn't support HDMI 2.0. DRM could make 4K video fail to play on desktop as well. Nowadays, although there are some 4K cracking sources on the web, it's still finite. Some users may purchase the licensed UHD BD for playback on computer, which leads to the DRM issue. AACS 2.0 and HDCP 2.2 are the main UHD BD copyright protection DRM mechanism. If your computer is unacceptable for AACS 2.0, you cannot read the UHD BD disc, and if the output port doesn't support HDCP 2.2, the resolution of output video won't reach 4K as well. So you do need buy a optical drive with 4K UHD BD support, together with PowerDVD to play DRM protected UHD BD. Discrete graphic cards that supports external 4K displays, including Nvidia GeForce (GeForce® GTX™ 970, GeForce® GTX™ 980, GeForce® GTX™ TITAN Z, GeForce® GTX™ TITAN Black, GeForce® GTX™ TITAN, GeForce® GTX™ 780 & 780 Ti, GeForce® GTX™ 770, GeForce® GTX™ 760 & 760 Ti, GeForce® GTX™ 750 & 750 Ti, GeForce® GTX™ 690, 680, 670, 660, 660 Ti, 650, 650 Ti BOOST, 650 Ti) and AMD Radeon™ HD 7000 Series or better. HDMI 2.0/HDMI 2.0a port, or DP 1.4 port. Potplayer or MPC-HC with LAV and madVR. Users do desire to build the best computer configuration to reach 4K videos' sharpness and clarity at most if possible. But actually it's very hard to meet every condition except for the real 4K fancier. If you're are budget-restrained, you may need process 4K videos instead. "Safari doesn't show me 4K option on YouTube, while it's available and always show in Chrome." "My iPhone 7 recorded 4K video in high efficiency cannot be opened and played on my Windows 10 PC." "I see no difference as I watch my iPhone recorded 4K video on my iPhone 8 and ASUS Zen AiO Pro." "I tried to play 1080p movie on my 4K TV, but the quality is fairly bad as it upsacled by the TV automatically." Firstly, the YouTube 4K videos are encoded with VP9 codec, which is not accessible for Apple's built-in Safari since 2016. And the 4K HEVC video recorded by iPhone fail to play on Windows 10, MacOS 10.12 or earlier, iOS 10 or above and Android because that such operating systems have no support of 4K HEVC codec. As for the almost same video playback effect in 1080p/720p and 4K on mobiles, it derives from the mobile display screen is far less than 4K resolution thus it'll be downscaled automatically to fit the mobiles' display. Likewise, as you play 1080p HD video on 4K TV, the 1080p HD will be upscaled to 4K content by 4K TVs' internal algorithm. But the quality will be cut down since you've expanded and split a pixel into four. Thus to successfully open the 4K files or for better playback quality, you do need transcode 4K video to make it widely compatible. Yes, 4K video has four times the pixels of 1080p, for greater potential, flexibility and fun, but bringing bigger file size as well. Generally, a minute of 4K video at 30fps steals over 375MB for H.264 codec and 175MB for HEVC, while a minute of iPhone 4K video at 60fps in HEVC eats up 400MB storage space. And a 10-min 4K video shot by GoPro Hero 6 will hog up about 4.8GB hard drive space as well. Take 64GB capacity iPhone X as an example, assume that you have nothing on your iPhone X except for the 4K or HD video you're going to shoot. Here comes the maximum 4K video recording time compared with 1080p and 720p. Therefore, if you want to store more 4K videos on your devices, it's inevitable to make a 4K video size reduction, which is not confined to downscale 4K resolution to 1080p/720p, but also lower the bitrate, frame rate and transcode H.264 4K to HEVC to save utmost 50% storage space at the same high quality. Uploading to YouTube or Vimeo has been a knee-jerk when there is an interesting video. It's no exception for 4K Ultra HD videos. But as you're trying to upload 4K videos to YouTube or the like, you might be troubled with slow speed, poor video quality after uploaded and even uploading failed. The first reason lies in that YouTube and Vimeo or the like have some limits for the 4K video specs. The verified YouTube users can upload videos longer than 15 minutes, but maximum size at 20GB. YouTube still recommends the best bitrate for SDR or HDR 4K video in standard frame rate (24, 25, 30) and high frame rate mode (48, 50, 60). For example, you'd better keep 4K video bitrate in 44-56Mbps for standard frame rate 4K HDR. Likewise, Vimeo has the similar 4K video specs requirements for uploading. And the limited data usage makes things more difficult. Vimeo Basic account allows for 500MB free storage space per week, 5GB a week for Plus members, and 20GB for Pro account per week. A good video can't be separated from post-production, so does 4K videos. I'm not here to tell you 4K video editing is the most important of them all, but here to tell you that without it, you'll be left with a complete mess. It's inevitable that your 4K video recordings are ruined by something unexpected and completely unpredictable. For example, the blown out light, passers-by, and unsettled weather, which looks like a stray duckling in swans. While 4K video editing will work it as a perfect flow through merging or trimming. Adding filters, watermarks, subtitles will also make your 4K video unique and personalized. Note that editing 4K videos requires a good hardware configuration, such as Intel i5/i7 CPU, GeForce GTX 1050 Ti GPU, at least 32GB RAM etc. If you're budget-restrained, why not pick up a 4K video converter with editing feature to make your shootings into a professional-looking home movie. You see, as 4K ultra HD video brings a better visual experience, its shortcomings, or rather the disadvantages of 4K rapid rising such as large 4K video file size (Learn How Big Is 1 Hour of 4K Video), substandard hardware configuration, incompatibility with some applications, incomplete compatibility with browers, operating system, devices etc. also drive you to process 4K videos indeed. So the next priority among priorities comes to seeking an all-around 4K video processing tool to convert, transcode, compress, edit 4K ultra HD videos for unrestricted playback on any devices. Part 4: Is There A Tool to Process 4K Video at Fast and Losslessly? Frankly, most 4K video converters are up to the 4K video processing job. Some can even upscale HD to 4K available for users who are unbearable to the pixilated HD/SD contents. But the end results vary greatly, or even daunting. Some tools output large files and blurry images. While some convert at a slow speed or even crash under the strain. And almost all of them pose a big pressure on hardware devices, making your laptops overheated, slow and battery drain fast. Luckily, MacX Video Converter Pro is exactly what you're expecting to process 4K UHD without any problems. It processes 4K UHD videos to smaller size up to 90% compression ratio, without any loss of quality, in 5 times faster speed than any other converters with level-3 hardware acceleration enabled. For example, to process a 4m29s 4K video, MacX merely calls for 1 minute to compress it from 4K to 1080p, while for Handbrake, 6m42s are needed to get it done. How MacX Achieves Such a Fast 4K Video Transcoding Speed without Quality Loss? The reason why MacX runs in a speed far ahead of Handbrake and other 4K converters lies in the the first and only level-3 hardware acceleration technology mostly, namely hardware encoding, hardware processing and hardware decoding. As you're processing 4K UHD videos with MacX, the Intel QSV tech built into Core i5/i7 Mac processors, or the NVIDIA® CUDA™ and AMD® GPU acceleration tech could accelerate 4K video processing as it runs on thousands of GPU cores in parallel, rather than the sequential part of the workload running on the CPU. Thus, to process a 4K video to 1080p with the same settings, the unique level-3 hardware acceleration supported V6.3.0 runs 3-5 times faster than regular conversion. In short, if your hardware configuration is good enough, built in GPU hardware acceleration tech, MacX will activate hardware acceleration in the 4K video processing workflow as follows. Better yet, MacX drops absolutely no loss of your video quality. The exclusive High-Quality engine and deinterlacing features make the video processing away from pixilation problems and unwanted noise. Actually it's done without any quality loss with the MP4 converter on Mac and Windows, no matter you compress 4K ultra HD MP4, MKV to H.264, HEVC, MPEG-4 etc., downscale 4K ultra HD video to 1080p/ 720p HD, 640p/480p/360p SD, drop iPhone 4K 60fps video to 30fps, upscale HD 1080p video to 4K, or downsize 4K resolution video by editing. What about MacX's 4K Video Processing Performances Compared with Competitors? Definitely, MacX isn't the only 4K video converter that enables hardware acceleration, but also others like Handbrake, AVC, Wondershare, and Movavi Video Converter. 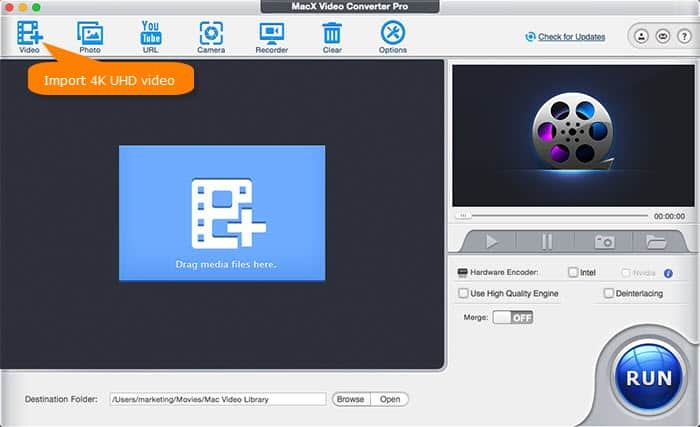 Compared with such 4K video converters, what are the advantages of MacX Video Converter Pro? We have a test to utilize them all to transcode 4K MP4 to 1080p H.264 with hardware acceleration enabled. The data speak for itself that MacX processes 4K videos with a good balance of speed, quality and file size. Make clear in beforehand, I'm running on my 27-inch iMac of 2013, with 3.2GHz Intel Core i5 processor, 16G 1600MHz memory, and NVIDIA GeForce GT755M 1GB graphics. Hardware encoding performance is greatly dependant on your computer configuration. The higher configuration your computer is, the faster speed the program performs. Part 5: How to Process 4K Videos with MacX Video Converter Pro? Now that MacX Video Converter wins the highest priority to convert 4K ultra HD videos fast without quality loss, why not free download the 4K video converter and give it a whirl? You can make 4K ultra HD video processing done in just a handful of steps. Step 1: Import the target 4K ultra HD video to the program. Launch the program and click on + Video button in the top-left corner. Then navigate to the first video you want to handle with, and click Open. You can import multiple 4K UHD videos in the same way to process 4K ultra HD videos in batch. Step 2: Select output profile. The program will ask you to choose the output profile from the pop-up window. It has dozens of ready-made profiles, covering all widely available models of iPhone iPad, general-purpose video formats and profiles for Windows PCs and many Android tablets and smartphones. Since different users have different demands for videos, here listed the most common demands and corresponding choice for output profiles. Scroll down to Mac General Video > MP4 Video (HEVC) > Done, and lower the bitrate by 20%-50%, maintain the frame rate for great fluency, and lower the resolution to 1920×1080 or retain the original if your MBP is available for 4K UHD playback. 2. To decode 4K ultra HD videos to mobiles. 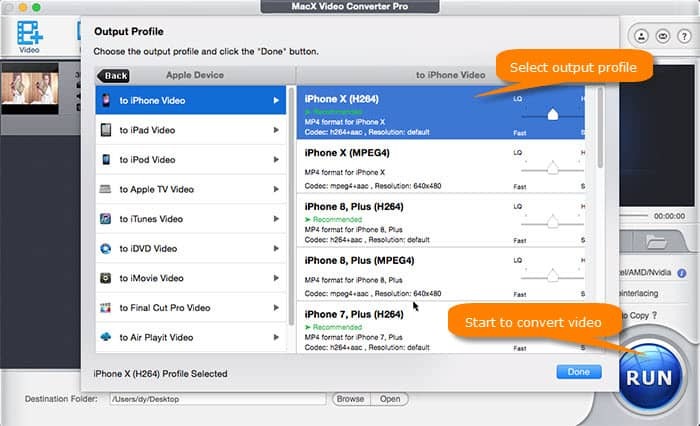 Take iPhone as an example, just choose Mobile Video Profile > Apple Device > to iPhone Video, and select your own iPhone model in H.264 codec, so that the Intel QSV/AMD/Nvidia tech could accelerate 4K video processing to H.264 MP4 at fastest speed. Choose General Profiles > MP4 Video (HEVC) > Done. Tap the , and here you're suggested to keep the original frame rate, change aspect ratio to 16:9, lower the resolution to 1920×1080 or 1280×720, and downgrade bit rate in accordance with the resolution, such as 2-5Mbps for SD, 5-10Mbps for 720p, 10-20Mbps for 1080p. If your video is too long or oversized, you have at the very bottom of the tricks would be to trim the video length. Click on , then enable Trim to set the start and end time. You can choose General Profiles > 4K MP4 Video > Done. Meanwhile, it all depends on your needs, you can upscale SD to HD, 720p to 1080p, or 720p/1080p HD to 4K indeed. 5. To process 4K ultra HD video at the top speed. Choose General Profiles > HEVC Video > Done, then move the sliding roller to LQ and Fast (left side). If you care less about video quality, click on , lower the frame rate to 30fps from 60fps, downscale resolution to 1920 × 1080 or even lower, and change aspect ratio to 16:9. 6. To process with highest quality reserved. Likewise, choose General Profiles > HEVC video > Done, but move the sliding roller to HQ and Slow (right side). Tick the box Use High Quality Engine and Deinterlacing before video processing. Step 3: Start to process 4K UHD video. Optionally, you can specify the output folder path to save your converted video through Browse button. Then tap RUN, the 4K video processing is in progress, and the hardware acceleration is starting to work it out in minutes. Oops, you might say you haven't done any settings for H.264 and HEVC hardware acceleration. In fact, if your computer supports it, the program will automatically tick the box of Intel/AMD/Nvidia hardware acceleration tech. By the way, the minimum hardware support for HEVC hardware acceleration transcoding and playback comes to Intel 6th-generation 'Skylake' Core processors, AMD 6th-generation 'Carizzo’ APUs, AMD 'Fiji' GPUs, Nvidia GM206 GPUs, Qualcomm Snapdragon 805/615/410/208 SoCs, Nvidia Tegra X1 SoCs etc. Part 6: How and Where to Get 4K Ultra HD Videos? No 4K content, all the other are empty. So it's highly pressing to get 4K ultra HD videos. But we have to face the reality that the original 4K video sources are few and far between except for 4K UHD BD and 4K streamings, the more 4K contents are recorded by video producers through mobiles, camcorders, drones or action cameras. Check the detailed way for getting 4K ultra video now. 1. Online Video Streaming Services and Hosting Sites. The high-definition video sources are on tap on YouTube, Hulu, Netflix, Dailymotion, etc. They offer a video resolution from 480x360 to 3840x2160. Particularly, YouTube reaches out to 7,680×4320 pixels. But formats of 4K videos vary from MPEG, MOV, MKV, MP4, OGG, 3GP, to WebM. 2. Phones and Tablets. Samsung's Galaxy Note 3 took the lead in 4k video recording among smartphones. Apple first enabled 4k 30fps video recording in its iPhone 6S/+ in 2015 and introduced 40 60fps video support in the latest iPhone 8 last year. There are still windows phones also capturing 4k ultra HD videos on supported hardware. 4k recordings are mostly saved in MP4. But Apple makes MOV as its default format. HEVC codec has been adopted in iOS 11 to half the size of video. 3. HD Camcorders and Drones. Camcorders and monitors also give you full access to shoot underwater excursions and extreme sports in 4k ultra HD, such as GoPro Hero 5, Canon, and Sony Camcorders, iBaby Monitor, to name a few. One more thing, there are aerial footages normally shot with 3840x2160 pixels, with DJI as the typical example. Most popular formats are H.264, MPEG4, AVCHD, DV, HDV, and MPEG2. 4. UHD BD discs. In recently years, a number of UHD BD discs have emerged, such as Despicable Me 3, La La Land, Spider-Man: Homecoming etc. All of them are encoded in HEVC codec, 4K (3840×2160 resolution) at frame rates up to 60 frames per second, and 10-bit color depth HDR. But they're copyrighted with AACS 2.0 and HDCP 2.2. So you need a 4K UHD BD supported player and optical drive to play it smoothly. 4. Others. Besides, 4k UHD videos have seeped into all aspects of our lives. You can either download 4k contents from torrent sites or get purchased copies from iTunes store or the like. People also save 4k videos from social platforms like Facebook, Whatsapp,or cloud services and more. Though 4K ultra HD becomes gradually available, there still a long way from being reached. It's a hot potato for playing 4K UHD on desktops none the less. You do need a graphic card built in 4K HEVC hardware decoding tech, a 4K supported video player configured with filter and renderer, HDMI 2.0 or DP 1.4 port, and a 4K monitors. When your hardware configuration is not strong enough, 4K video processing would be a nice choice. However, we can foresee the coming future when UHD BD is cracked widely, and 4K UHD videos are everywhere. The video players will support 4K HEVC playback smoothly like what it supports 1080p HD today. And the 4K-unfriendly graphic cards, ports will be weeded out, making computers an excellent tool to play 4K ultra HD videos. How Can You Reduce 4K Video Size to Times Smaller Losslessly? Learn how to process/edit videos without stuttering or lagging.